NYC, 11/09/2018, 7:00PM. Works from 19C France. Violinist Naho Parrini explores the relationship between composers in nineteenth century France and how they expressed their friendship by dedicating works to one another. 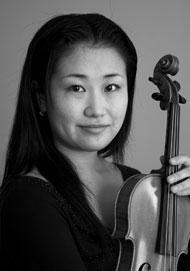 Naho Parrini is an active recitalist and chamber musician. She has given numerous recitals in the United States, Japan, Germany, and Bulgaria, and has performed at prestigious halls such as the Merkin Hall, Lincoln Center, and the National Palace of Culture in Bulgaria.